The International Male Solo Artist Michael Buble is here in the Philippines for his one day concert at the Mall of Asia Arena in Pasay City. One day before his concert, Buble have his interview with the "Aquino & Abunda Tonight" host Kris Aquino. Kris Aquino made a live interview to the Canadian singer on Friday at the studio of their TV show. 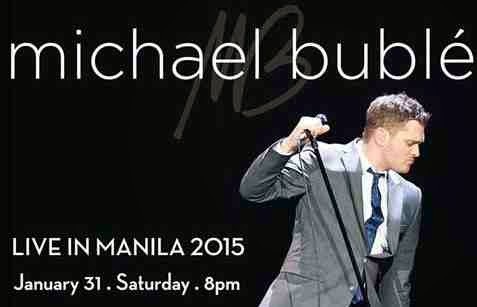 This is the second visit of Michael Buble to the Philippines. The host and the singer drew laughs during the live interview when he spontaneously asked host Kris Aquino for a selfie to mark his "official welcome" to the Philippines. According to ABS-CBN News, After the live interview, the superstar crooner Michael Buble posted their selfie photo with Aquino to his official Instagram account with the caption, "Hey Manila !!!! Thrilled to be back in the Philippines and thanks to @aatofficial and @beingkrisquino for the incredibly warm welcome. #homeawayfromhome #salamat #crushonkris #MBworldtour"
Comments or suggestions about "Michael Buble takes selfie with Kris Aquino on Instagram" is important to us, you may share it by using the comment box below.